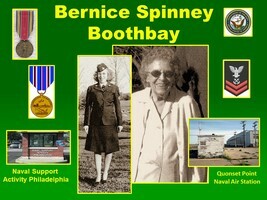 Provide comfort for the family of Bernice Spinney with a meaningful gesture of sympathy. Bernice Mae Spinney, 94, died December 23, 2018 at Lincoln Health – Miles Campus in Damariscotta. She was born May 19, 1924 in Boothbay to Donald Desmond Cunningham and Ruby Inez Stover. Bernice graduated from Camden High School in the class of 1943. She worked as a secretary at Camden shipyards after high school. Bernice enlisted in the WAVES on August 1, 1944 during WWII. She served at the U.S. Naval Aviation Supply Depot in Philadelphia, PA., and at the U.S. Naval Air Station in Quonset Point, Rhode Island until she was released into inactive duty in 1947. Bernice was awarded the American Campaign Medal and the World War Two Victory Medal for her service. On April 4, 1951, Bernice was called back to serve during the Korean War until she was discharged as a 2nd Class Petty Officer from the Navy in Boston. After the war, Bernice worked as a secretary and town clerk for the town of Boothbay and retired after 27 years of service in 1989. She enjoyed feeding wild life including squirrels, chipmunks, birds and ducks. She was a member of the American Legion and WAVES National. She was predeceased by her husband, Everard Spinney; sisters, Donna Waggoner, Dorothy Sherman; brother, Carroll Winslow. She is survived by her son, Christopher Arrington of Trevett, daughters, Cynthia Craig of South Bristol and Wellington Florida and Lori Merrill of Wiscasset, daughter-in-law, Marjorie Marr of Boothbay Harbor. Special cousin, Joan Stover of Boothbay who the family greatly appreciates for all of the help she provided. A graveside service to celebrate Bernice’s life will be held at 1 p.m. on Saturday, December 29th at Evergreen Cemetery, Barter’s Island Road, Boothbay. Should friends desire, contributions in Bernice’s memory may be made to Midcoast Humane Society, P.O. Box 7, Edgecomb,ME 04556. Arrangements are entrusted to Hall Funeral and Cremation Services, 975 Wiscasset Road, Boothbay. Provide comfort for the family of Bernice Mae Spinney by sending flowers. Bernice shared these photos with me several years ago. The campaign medals and photo locations reflect her valued service.